Tampa Florida divorce, personal injury, accident, and criminal lawyer Christina Mesa is a Martindale-Hubbell AV® rated attorney with 26 years of experience. Less than five percent of America's lawyers have an AV® certification which is their highest rating accomplishment - a testament to the fact that a lawyer's peers rank him or her at the highest level of professional excellence. 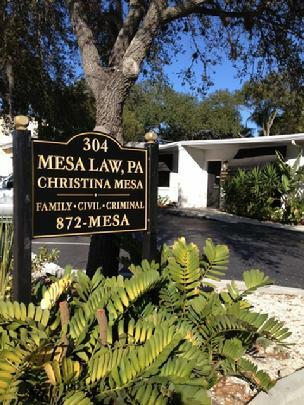 Christina Mesa was also identified in Florida Trend's Florida Legal Elite®. Over the last 26 years she has gained extensive courtroom experience by handling hundreds of successful jury and non-jury trials. MESA LAW, PA represents parties in matters involving family law, accidents, personal injury, criminal law, DUI, employment law, probate, and general civil litigation. We offer consultation and/or litigation services in both civil and criminal courts in the Tampa Bay area. Family: Divorce, child support and custody, property distribution, pre/post divorce matters. Injury: Car accident, truck accident, medical malpractice, personal injury, wrongful death. Criminal: DUI, Felony, Misdemeanor, Juvenile. AVVO Top Contributor. Click For Reviews.